Sale » Roger Perron Inc.
We would like to take a moment to thank you and your staff for the beautiful remodel of our house. It was a great experience working with you. We felt that we always had someone by and on our side. From the design phase, through the build, and all the way to making sure everything was functioning properly when we finished, you were there for us. Your advice and wisdom helped us transform more than just our kitchen and bathroom. It made a building our home. It is a fantastic feeling to walk into our house every day and see the results of all your hard work. One of our favorite things is the way you designed everything to blend into our existing house. The new areas look like they were always there. A real magic trick! The kitchen area has become a central gathering area in our home, a true warm addition. And the new bathroom has a spa-like feeling. You really did a lot with a small area. We love it. Barbara is a fantastic customer service representative whose smile I can see when she answers the phone. Communication is key to a large project and she kept us all connected. Alicia is an invaluable designer. She helped us design and select the beautiful tiles, colors, hardware and a million other things that we live with every day. Things that make us love our house. Mark, Troy and the rest of your home builders are exceptional. 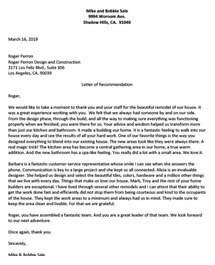 I have lived through several other remodels and I can attest that their ability to get the work done fast and efficiently did not stop them from being courteous and kind to the occupants of the house. They kept the work areas to a minimum and always had us in mind. They made sure to keep the area clean and livable. For that we are grateful. Roger, you have assembled a fantastic team. And you are a great leader of that team. We look forward to our next adventure.